This year's event is over. See you next year! Have a question about the Carnival? Check Availability? Suggestions for travellers? Ask! Specific comments and questions will help us help you better! Your email is required so we can respond to you, but will remain private. Add your phone number if you would like one of our staff to give you a call about your question or reservation. Looking for a vacation help? We'll send you the "short list"! Rather than searching countless sites, let our local, knowledgeable staff do the work for you! Just tell us what you want! 3. View, share and book online from the custom quote. It's free! It's cool! Give it a try! Follow us for a chance to win a $40 travel credit every month! The McCall, Idaho Winter Carnival offers snow sculpture viewing, fireworks, parades, and a true carnival atmosphere over two weekends. The festival is always held the last weekend of January through the first weekend in February. McCall is a popular Idaho resort town located 100 miles north of Boise. It is famous for winter activities including skiing and snowmobiling and summer activities including Payette Lake, hiking, fishing, rafting and more. Lodging for this event sells out early. Call us at 1-800-844-3246 for availability at all hotels, cabins, vacation rentals and condos in McCall, New Meadows, Cascade and beyond. 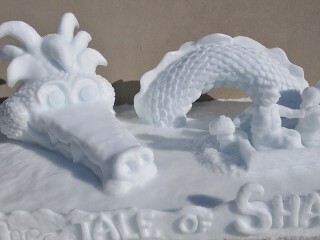 2019 is McCall's 55th anniversary of visitors enjoying the spectacular snow sculptures doting the streets through out the community. They come in all shapes, sizes and themes from small to tall (over 20 feet!). At InIdaho, we love Winter Carnival because of all of the energy created by the thousands of people who come to McCall to celebrate in the middle of winter. The food vendors, parade, sculptures, events and opening and closing fireworks truly make this one of America's great festivals. In the beginning of this local tradition, residents constructed the sculptures in front of their homes. Gradually, the sculptures moved downtown where local businesses carry on the spirit of fun and festival. Snow sculpturing has developed into an event that receives national recognition, with our teams going forward to compete in international events! In addition to enjoying over many entrants around town, visitors take part in a two full weeks worth of activities. Most businesses, including the Activity Barn Snow Tubing Hill have extended hours. Winter Carnival in McCall is also a great time to ski Brundage since many of the visitors aren't here to ski and the mountain remains quiet despite the town being full. We look forward to helping you plan your trip (the earlier the better), and if you are last minute give us a call because InIdaho will always know where to find the last room available. InIdaho.com is the official reservation service for the Winter Carnival Organizer (the McCall Chamber of Commerce). Part of the proceeds from your reservation made through InIdaho.com go to support the Chamber's efforts. Through InIdaho.com you can make reservations for McCall area hotels, motels, vacation cabin and condominium rentals and more. This free service is truly "One-Call McCall". We'll help you find the perfect place if you make your reservations early, or find you last second availability if you decided to join the fun last minute. Please note that this is based on the 2018 schedule. Final updated schedule will be posted in January. Winter Carnival events are held all over McCall. Use the pull-down menu below to select a particular venue and click on the map icon for additional location information. InIdaho.com welcomes questions about this event to help you plan your trip to the Carnival in McCall. Question: The McCall winter festival dates currently posted seem a little odd. We would like to make reservations but the dates don't look right. Is there anyway to confirm the dates of the Winter Carnival? Answer: @Matt: McCall's 2018 Winter Carnival starts the last weekend in January, 1/26/2018, and runs thru 2/4/2018. Question: What is the theme for ice sculpture this year 2017? Answer: @Kristine: It is "1 Valley, 100 Years"
Question: What are the dates for the 2017 McCall Winter Carnival? Answer: @Rondi: McCall Winter Carnival is always the last weekend of January and first weekend of February. Question: What are the dates for the 2016 ice carnival? Question: Does the snowshoe golf include snowshoes? Answer: @Amy: Snowshoes are not included. If you don't have your own you can rent at most of the sporting good shops in McCall. Question: which events have cost associated with them? Answer: @Mimi: Almost all events are free. Some of the events that have a charge are the hockey games, comedy night and bingo. Some of the bars may also charge a cover charge for events. Question: Are dogs welcome at the carnival? Answer: You can bring you pet on a leash as you walk around town to view the Carnival. Question: I have never been to the festival and will be bringing a 2 1/2 year old with me this year. What is the best day for him? Answer: @Kelley: On Saturday of the first weekend there is a parade at noon so this is the most popular day of the carnival. However, the first Friday and the second Saturday there are fireworks that are amazing over the lake. Question: When is the Festival in 2015? Answer: @Ineta: The Winter Carnival always begins the last full weekend in January. In 2015, it will be held Jan 30-Feb 8, 2015. Question: 1.What is the vendor booth price? 2.Deadline date for applying to be a vendor for the Winter Carnival Festival in McCall, Idaho January 25, 2013 - February 3, 2013 3.admission price? Answer: @Blessy: Prices and deadlines have not been set for the 2013 Winter Carnival. Generally you must have all forms including a central district health approval (if applicable) 14 days prior to the event. There is no admission fee at most events including the vendor food/craft location. Please give the Chamber of Commerce a call for prices. Question: Who won the sculpture prize? Question: I see there is a hockey game on Friday, January 27th. What is the ticket price? Can they be purchased at the door? Answer: @Lorena: BSU is playing Idaho on January 27th at 7:30pm. The doors open at 7:00pm. You can buy tickets at the door for $12.00 general admission. Question: How much snow do you have now? Answer: @Kelly: McCall received a lot of snow overnight and it is still dumping (19 inches at Brundage in last 24 hours)! This means that we will have snow sculptures as well as other types of sculptures from the community! Question: Is Winter Carnival happening this year with the current snow? Answer: @Judy: The show must go on! We hope to have plenty of snow in time for the festival, but even if Mother Nature doesn't cooperate the Winter Carnival will go on. Fireworks, parade, bingo, casino night, dances, beer gardens, music and on and on. Come on up and support this community event. Will be fun! Question: What is the vendor booth price? Answer: @Anoop: For the McCall Winter Carnival booth space you can contact the McCall Chamber of Commerce. We will e mail you their contact information. If you need help with lodging please let us know. Question: I didn't know there are fireworks at opening ceremony. Is that Thursday or Friday night? Question: Are the fireworks over the lake? Answer: @Nancy: Both opening and closing ceremonies shoot the fireworks over Payette Lake. Question: Are there any places to stay left? Answer: @Steve: Hi Steve, we still have availability including hotels, condos and cabins. Please contact us either by phone (800-844-3246) or by submitting a quote request form so we know the dates, number of people and what type of lodging you would prefer. We are a free reservation service for the State of Idaho with over 1,300 places to stay & things to do. Just let us know what you are looking for and we'll find the best options for your trip! Our service is 100% free with no hidden booking fees. Book any of McCall's lodging options including hotels and professionally managed (no "by owner" here!) Cabins, condos and other vacation rentals with one-call. Over 250 choices in McCall alone! Our lodging customers can purchase discounted activities including Brundage & Tamarack ski tickets, Activity Barn Tubing Passes, and Ice skating tickets. We live in McCall. We can answer your questions and make recommendations on where to stay and things to do. "Easy to use. Staff very friendly. They reached out to me via email. Very quickly after responding via email, I had a condo that I could reserve. The staff made the experience very painless. They are so friendly and want you to have a good experience. They do the hard work for you. " Jim from Sparta, Mo reviewed our service on 4/8/2019. About McCall, Idaho McCall is a small resort community nestled on the shore of beautiful Payette Lake and is known as one of Idaho's most popular resorts. McCall was founded as a timber town and has grown into a popular year round destination. Located 100 miles north of Boise, McCall is just a two-hour drive along the Payette River Scenic Byway from its gateway city. McCall is home to Brundage Mountain, Ponderosa State Park, the U.S. Forest Service Smokejumper Base, and the annual Winter Carnival. McCall offers something for everyone throughout the year. InIdaho.com is based in McCall. We love it here!